Life in Balance | Snap, crackle and pop! 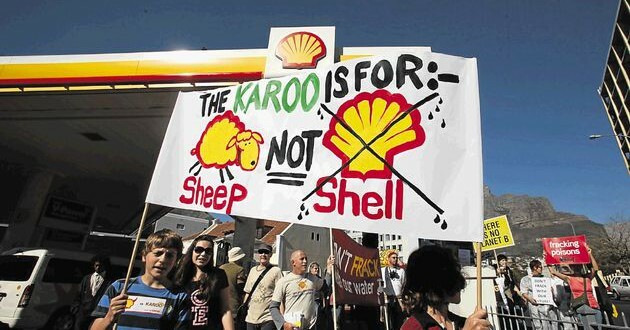 Despite changing the venue at the last minute, around 300 people made it to the Shell public meeting at Kelvin Grove in Cape Town regarding their fracking prospectus for the greater Karoo. Shell’s representatives and an independent facilitator were on hand to field the many questions asked by concerned land owners, members of the public and environmental groups. A quick review of the facts; Shell has applied for permission to frack for natural gas and if the Environmental Management Plan is approved it will grant the ‘right’ to explore 24 wells over 3 blocks of land of 30 000 sqm each. Shell’s marketing executive ‘assured’ the audience they would not compete for water resources that are meant for the population and for the animals but as yet it remains unclear as to where exactly the water will come from. Millions of litres are required for each well and even though they stood before the audience ‘reassuring’ that the technology for fracking has improved, Shell’s track record and its exploration for fossil fuel energy resources are not something you would want to support without a shadow of doubt. Another question was what type of chemicals would be used in the water to enable the fracking process to take place. Even direct questions were sideswiped and it became clear to everyone present that there is a lot of information Shell is not ready to disclose because they do not have the answers. Instead we were told that the chemicals they would use would depend on the type of rocks they encountered as they drill down up to 3kms at a time. When you consider the road systems required for transporting water, rigs, well infrastructure, etc. you start to see geographical engineering logistics that will be in direct conflict with the pristine open spaces and delicate ecosystems that make up this vast landscape. The greater Karoo is an extreme place where the natural forces determine how the farmers can go about their business. Land values will be devastated by the wells, and to top it all Shell can’t even disclose where they intend to begin their prospecting. Does one take the map, throw a dart at it, as if to a dart board, and then declare, “Well, that looks like a good spot.”? Or will it be the result of a farmer selling his land to them that will decide where they begin? If this energy source was sustainable and led to long term economic improvement of the whole region then it may be a point to debate but with all the negatives associated with this process and the very real threat of aquifer contamination, it is a totally unsustainable venture. But now we have to listen to rhetoric, delivered as if to a grade 6 class of eager geography and science students, who know instinctively this whole thing stinks to high heaven. Lewis Pugh was the champion who looked into the eyes of the Shell representatives and laid claim after claim about their appalling behaviour in Nigeria, the millions of gallons of oil dumped into the Niger Delta and their implication in the murder of an environmental activist Ken Saro Wiwa (they paid a 15.5 million USD ‘settlement’ to his widow and those of 8 other activists murdered http://wiwavshell.org/. Lewis became our voice as he stood before them holding our hard fought for constitution and told them in no uncertain terms they have a fight on their hands. He challenged them as only a man who can swim the waters of the Arctic can – resolved, focused and invincible. We do have a chance to voice our stern rejection of this proposal and to voice the rejection of the proposals also in place by Anglo, Sasol and Bundu Gas to do the same thing. Please join the action groups, post the speech to your Facebook page, share it on Twitter and extend this news to your whole network as this is one of the most important fights we have on our hands since the dark days of apartheid. This land is our land and this land is your land; our water rights are our rights to life and we cannot let another energy giant destroy a pristine environment when there are alternatives like solar and wind that require just as much exploration. Why an area of 90 000 sqm if only 28 wells are to be explored? The government is supposed to work for the people and it is our civil right to say NO to the destruction of an environment and water resource should (and this always means ‘when’) an accident occurs. Where is the gas going to be sent? A Shell representative said it may be used for electricity – which means power lines will need to be built. The deep water issues have not been succinctly addressed and saline water can be used for cattle farming so this rules any saline water found under the ground OUT for use in the process. We need at least another 120 days to respond to the final EMP report and currently it looks as if the report will only be complete when the license is due to be granted. Gareth Morgan, MP, is unable to get information from government on any mines that have deviated from their environmental impact assessment plans so there is no accountability. Consider the acid mine drainage problem in Gauteng and you see the lack of accountability, or concern for clean up actions after the mines have closed down. The largest telescope in the world is operated out of Sutherland and the Northern Cape has more sun the Mexico so where is the exploration for solar energy? What percentage of Shell’s profits is ploughed back into sustainable energy ventures? 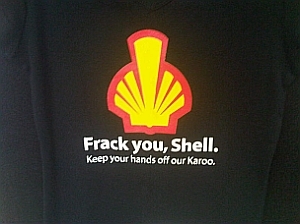 The Shell representatives ‘don’t know’. Who stands to profit from this venture?